While the bus we call Priscilla was in LA, it got torn apart. We need your help to get her back on the road. People are donating whatever they can. Can you? Last year, the No Papers No Fear Ride for Justice challenged the Sheriffs and overseers of anti-immigrant laws and challenged all of us to have no fear. Through civil disobedience, art, and organizing the undocubus became a symbol of inspiration and a sign of our resistance. We won't let vandalism derail us and we're planning to ride again. Over the past year many have had their hopes raised by immigration reform and families shattered by continued deportations. Now more than ever, we must fight for and make the change we want to see. If our elected officials don't have the courage to do what is in their power, we will again show them what it looks like to be fearless. 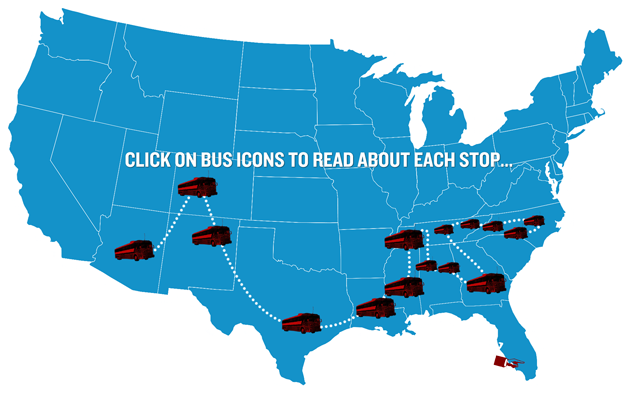 Follow the UndocuBus route as it travels starting July 28th. We'll keep the map updated with blog posts and reports as we visit hot spots and communities on the front lines across the country. How we resolve this debate will either advance or set back civil and human rights for our generation. The people below have influence over the debate. If they support our effort, they move thousands with them. Ask these leaders to get on board with the riders and support inclusion over exclusion. Click on their image to ask them to get involved. We've come too far to go back. Will you stand with riders who are risking everything to turn the tide on immigration from exclusion to inclusion? Undocumented mothers, fathers, students, sons and daughters will challenge the champions of hate with stories, voices, and action through key states in the Southern US because we're tired of facing deportation, harassment, and being taken from our loved ones and we're ready for a new day. Sign up to receive updates and express your support for the ride. Add me to the social media squad. We travel to North Carolina first and foremost because it is a place, like so many others across the country, that faces the federal and local policies that criminalize and marginalize our communities. It is the home of the Shogun 12, it is the home of emerging day labor centers and where undocumented youth have come out of the shadows in the face of repression. A movement is building and growing across sectors in North Carolina that includes the LGBTQ community, Occupy, families of and formerly incarcerated people, labor and worker organizations and many more. We come to North Carolina first and foremost to build with local communities. The Democratic National Convention will be held in Charlotte September 3-6th, 2012. When we arrive after having braved so much, will we be included as undocumented leaders, as honorary delegates, as people who have felt the direct impact of today's immigration policies, or will we be excluded? Decision-makers who feel our community's pain can take decisive action to end it. We're ready to move the country forward and we're risking everything to do so. We hope to inspire officials to match our courage. Every year the Department of Homeland Security removes 400,000 people from the United States. Over the last four years, president Obama has deported over 1 million people. There is a rise of collaboration between local police and immigration agents through programs like Secure Communities, implemented in over 98% of counties in the country. And in June, the Supreme Court gave permission to police officers in Arizona to ask people for their immigration papers, if they are suspected of being undocumented. Meanwhile, both parties have turned the suffering and life of undocumented immigrants into political football, passing the responsibilities to each other. On the other hand, we have also witnessed how actions led by our own communities have the power to change policies and to create alternatives to defend the rights of immigrants. In Arizona, Barrio Defense Committees have organized to share information about how to fight against deportations, and against those who seek to criminalize immigrant communities. Actions by undocumented students, such as coming out of the shadows, civil disobedience, and occupations of electoral offices have shown what happens when our community acts for itself, it changes everything. We can't wait for anyone else any longer. We've come too far to allow this country to be turned back. This summer a culmination of this work will be manifested during a Bus ride, through key states in the southern part of the United States, that will continue to confront power with the stories, voices, and actions of those directly affected by these immigration policies. Riders are undocumented people from all over the country, including students, mothers and fathers, children, people in deportation proceedings, day laborers, and others who continue to face deportation, harassment, and death while simply looking for a better life. The tour began on July 29th in Phoenix, Arizona, following a week of action calling for Sheriff Arpaio to be brought to justice and for the federal government to stop collaborating with Arizona's crisis. We will head through key states, including New Mexico, Colorado, Texas, Louisiana, Alabama, Georgia, and Tennessee. The tour will end in North Carolina at the Democratic National Convention. Riding the bus alone is a great risk because of the checkpoints and profiling that has become so common. But the ride is also arena for mobilizing, where we will build with those who have a story to tell, who have realized the only secure community is an organized one. We have overcome our fears and are ready to set a new example of courage. We hope this country and its officials will be brave enough to follow.